This year I have been showing my Just Nan 12 Days of Christmas blocks for the Smalls SAL and also my 30-a-day projects. All smalls also by Just Nan. It's a Nan-a-thon year! October was a little bit different though. I managed to get all of Day 10 done except the number itself in September so I could clear the decks for Dark October stitching. From the 1st October I used the Tiny Decisions app to choose my project each day. This was very successful and I got two more Small finishes out of that plus one larger one which I will save for the WIPocalypse post. The first finish is by Plum Street Samplers, the freebie called Brew Ha Ha (click for the link to the design). The second finish is a cute JBW design called Smiling Jack-O-Lanterns. All I had to do on this one today was the very fiddly plaits. Finally, I have everyone signed up for the Hallowe'en Blog Hop so I will be choosing the Mystery Phrase over the weekend and emailing everyone with their letter and further instructions. If you signed up and don't get an email, please do contact me. I'd hate to miss anyone out. Congrats on more cute finishes Jo. 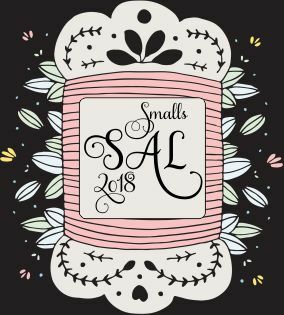 Love your smalls for the month. Congrats on the finishes. Nice finishes! Thank you for the Brew Ha Ha chart! Great stitching. I bet those braids were a bit tricky! Love all your smalls , your posts are always so colourful. Have a fun week with your family . The platinum linen is perfect for your adorable Halloween stitches. Such patience you have for those braids!! What lovely stitching and cute designs! Wonderful finishes Jo. I think the smiling Jack o Lanterns is my fave. The JBW turned out fabulous didn't it. Cute pieces and thank you for the Brew Ha Ha link. All your projects are so cute! The frog for the Leaping Lord is very clever of Just Nan! I love the JBW project, her hair is so pretty! I love your finishes; they are all very cute. Love you stitching, especially the Smiling Jack-O-Lantern. Once again I have enjoyed my visit. All your projects are gorgeous, but it's the Just Nan 12 Days that grabs at my heart each month. Beautiful stitching! Great job getting three finishes out of your dark October!